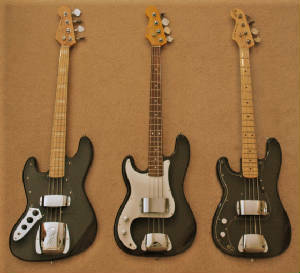 As this page will attest, I have a passion for Fender basses - some might say an obsession! The left-handed variety is a little tougher to come by, so I wanted to share with you the results of my searching for them over the past few years. Hope you enjoy it! '57 reissue made in Japan P-bass with custom replacement neck. Custom repainted Sonic Blue with original one-ply white pickguard. Upgraded with thumb rest and chrome covers. with a '62 reissue three-ply white pickguard. Upgraded with chrome covers. '57 reissue made in Japan P-bass. I believe the color is Electron Blue with original one-ply white pickguard. It's a brighter, deeper, metallic color than Lake Placid Blue. I have seen it called the New Lake Placid Blue. At any rate, it's a nice vibrant color. From my experience, it seems to be a rare color. Upgraded with chrome covers. This is the first bass I restored. When I bought it, it had a poorly applied peeling turquoise paint job and someone had nicely routed and installed a jazz pickup in the bridge position. 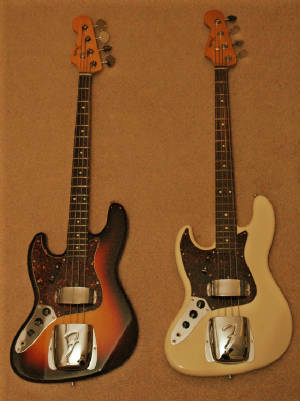 Since the bass had been modified, I decided to refurbish it in an early 60s custom style. I had Kevin Forder rewire the bass using stacked volume and tone controls. I repainted it with my own custom mixed seafoam green pearlescent flip flop color. When looked at in different angles and lights, it changes color with subtle blue, green and purple hues. This paint was probably influenced by my motorcycle and hot rod painting days. I chose a three-ply white pearloid custom made replacement pickguard with new Fender chrome covers. '62 reissue made in Japan P-bass. Custom repainted Lake Placid Blue body and matching headstock with original three-ply white pickguard. Upgraded with thumb rest and chrome covers. 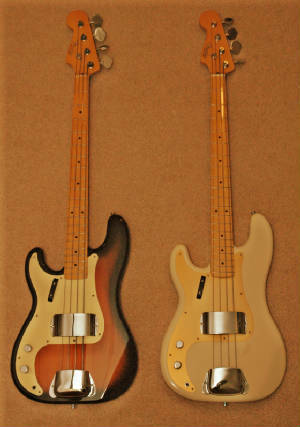 Custom 60s Fender style jazz bass with MIJ '62 reissue body and a custom replacement neck with pearl white block inlays. Custom repainted Lake Placid Blue body and matching headstock with original three-ply white pickguard. Upgraded with thumb rest and chrome covers. '57 reissue made in Japan P-bass. Vintage White body upgraded with a gold anodized pickguard, thumb rest and chrome covers. '57 reissue made in Japan P-bass. Two-tone Tobacco Burst body upgraded with a gold anodized pickguard, thumb rest and chrome covers. This is my every day player. It's the first bass I bought when I began playing music again. I walked into Atomic Music in College Park and found it hanging on the wall pretty much as you see it. I added the chrome bridge cover and took off a chrome jazz bass pickup cover. It's a '78 Fender body with a natural finish, three-ply black pickguard and vintage DiMarggio pickups. The neck is made by ESP with a '51 style headstock. I use this bass for 98% of my performances. I love its sound. 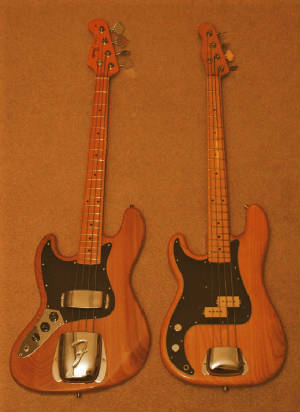 None of my other basses are even a close second. Can't explain it except all the right pieces work together. When I first bought it, I switched the neck with a vintage '78 neck; it wasn't even close to being as good of a sound in punch, volume and sustain. 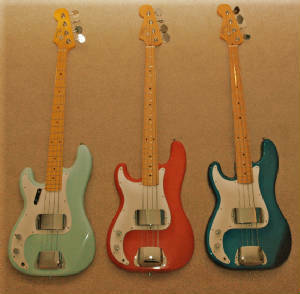 So I traded the necks back and refinished the other bass in the Sea Foam Green custom paint pictured earlier. 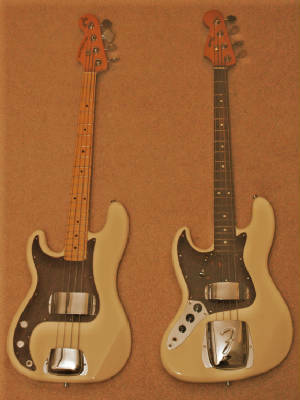 Custom 60s Fender style jazz bass with a natural finish body, two-ply black pickguard and vintage tinted neck. 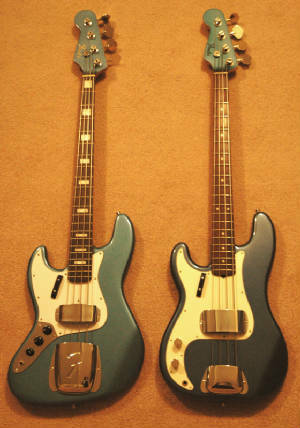 '75 reissue made in Japan Jazz bass. Natural body upgraded with pearloid white pickguard, thumb rest and chrome covers. Honey Blonde custom hand-made body with one-ply black pickguard and Humbucker pickup with a vintage tinted tiger maple neck. Two-tone Tobacco Burst body with one-ply black pickguard with a vintage tinted maple neck. '62 reissue made in Japan P-bass. Black body with a three-ply black pickguard and maple neck with rosewood fingerboard. Upgraded with chrome covers. 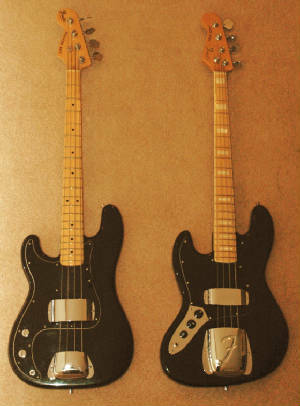 '77 Fender P-bass with black body, 3-ply black pickguard and maple neck - all original. 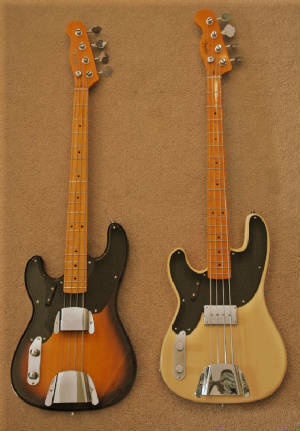 Custom 70s Fender style jazz bass with a black body, two-ply black pickguard and a white bound neck with pearl block inlays. 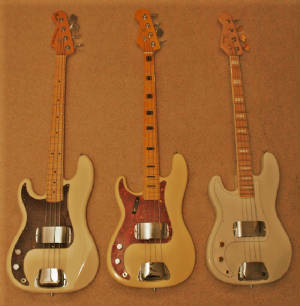 Custom 70s Fender Style P-bass with a Olympic White body, three-ply white pickguard and a white bound jazz neck with pearl block inlays and gold hardware. 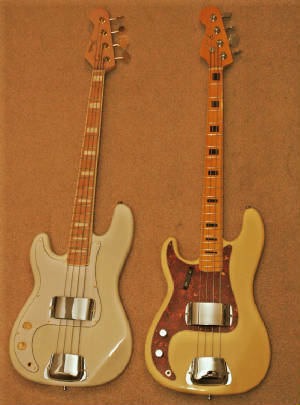 '78 Fender P-bass with Vintage White body repaint, 3-ply brown tortoise shell pickguard and maple neck. Custom '70s style Fender P-bass with aged Vintage White body, 3-ply red tortoise shell pickguard and maple neck with black block markers. 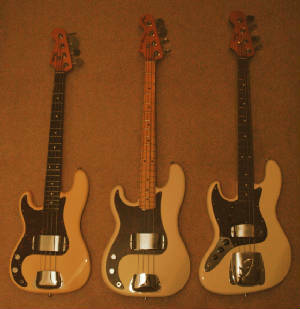 '78 Fender Fretless P-bass with Vintage White body, 3-ply black pickguard and maple neck - all original. MIJ '62 Reissue Three Burst body, brown tortoise '62 reissue pickguard, chrome covers and a MIJ '57 reissue maple neck. '83 Fender P-bass with original Vintage White body and 32" maple and rosewood neck, replaced 3-ply brown tortoise shell pickguard and upgraded with chrome covers. 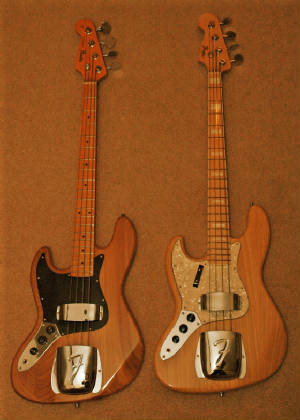 You don't see too many of these; everything is in scale, just a little bit smaller than a full-size P-bass. I have not been able to determine whether its made in U.S. or Japan. 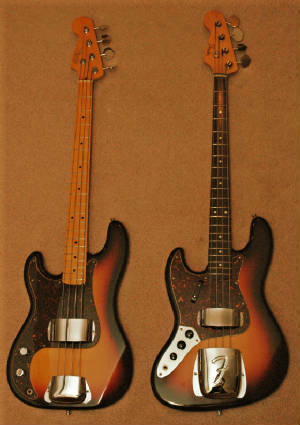 '62 reissue made in Japan jazz bass with Three Tone Burst body, brown tortoise pickguard. Upgraded with thumb rest and chrome covers. 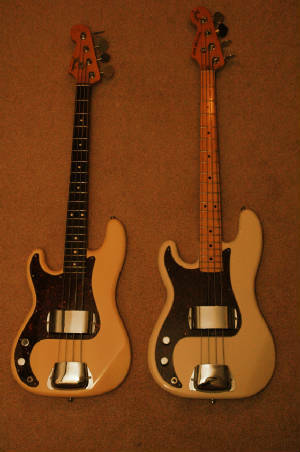 '62 reissue made in Japan jazz bass with Vintage White body, brown tortoise pickguard. Upgraded with thumb rest and chrome covers.